Eddie Robinson - 2 full seasons and 3 partial seasons (1942, '46-'48, '57) - Robinson previously appeared in our All-Time list wearing Number 3. 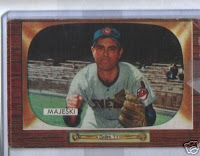 During his brief appearance in 1957 with the Tribe, he sported Number 6. 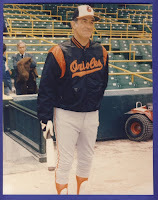 As reported before, he played for three teams in 1957 (Tiger, Indians, Orioles) but his best run during that time was during his 19 games in Cleveland (batting .222 versus batting .000 for the other two teams). Here is a recap of the rest of his Indians career: He played in 8 games each for his first two seasons with the Indians. In '47, he hit 14 homers and brought in 52 total RBIs. 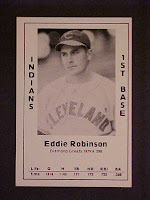 He then went on to help the Tribe win the World Series in '48 after batting in 83 RBIs and 125 hits in 134 games. He is most notoriously known for not lending Larry Doby his first baseman's mitt (according to snopes and other internet sources). Ever Magallanes - 1 season (1991) - Magallanes batted in three games, though only appeared at the plate twice. He was sent to first on balls and had a strike out, netting him a .000 average yet a .333 OBP. In 1995, after several years in various minor league systems, the Indians re-signed him in 1995, only to drop him two months later (no pro-appearances). Jack Kubiszyn - 2 seasons (1961-62) - In 1961, he wore Number 6, but switched to Number 2 in 1962 (which ironically together gives him the final year of his major league career - 62). He is another Triber who we have seen before. He played in 25 games each year his baseball career. He averaged 214 the first year and fell off to 164 during his second. His 50-game stint in the Bigs netted him 1 home run. Jim Thome - 12 seasons (1991-2002) - It is no secret that Thome is one of my all-time favorite players. In his rookie year, he wore the number 6 briefly before switching to his preferred Number 25. Thome's career with the Tribe set home run records, including the farthest hit in a Cleveland stadium (511 feet, thank you), strikeout records (while maintaining .265+ averages), and base-on-balls records (often having as many walks as hits during many seasons). His Indians career gave him 4640 at-bats in which he got 917 runs on 1332 hits with 259 doubles and 20 triples as he knocked in 334 home runs, resulting in 927 RBIs. His Indians-career average of .278 includes 997 walks and 1377 strike outs. Not only did he knock the ball around, he also swung at a LOT of balls, but also laid off more than a fair share (for which he was often criticized). He made three All-Star appearances as a Triber, helped the Tribe in six division series seasons, three league championship series, two World Series showings. While doing some research, I found this little ditty: "Thome, who wears his socks high to honor his late grandfather, grew up a Cubs fan in Peoria, Illinois. At the age of ten, he jumped onto the Wrigley Field turf to get Dave Kingman's autograph, only to be hoisted back into his seat by Chicago backstop Barry Foote." Though not a contender for Uniform Number 6, he certainly has a shot at Number 25, so we'll see him later in the countdown (count-up!?). 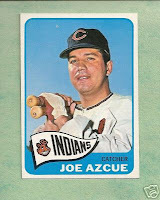 Joe Azcue - 7 seasons (1963-1969) - Azcue wore the Number 6 for his entire Indians career except for 1967, in which he wore Number 7. Azcue's 100 hits, 23 runs, and 42 RBIs earned him a spot on the 1968 All-Star team. He came to the Tribe in '63 from the A's, and he finished his first year in Cleveland with a .284 average. During his Indians career, he only had one season below .250, and five of his Indians' seasons were better than .270! His career in Cleveland gave him 1904 at-bats with 506 hits, 229 RBIs, 132 walks, and an overall average of .269. A couple of his interesting career facts include catching two no-hitters, and being the first person to hit into an unassisted triple play since 1927 (41 years) (July, 1968) - ouch. Joe Vosmik - 7 seasons (1930-1936) - Who says looks don't mean anything? According to BaseballLibrary.com, Indians' manager Billy Evans asked his wife what she thought about the tryouts. She reportedly chose "the good-looking blond boy," and what a choice she made. 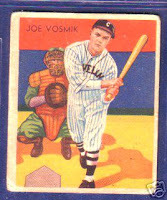 Vosmik grabbed a spot on the 1935 AL All-star team with his incredible .348 batting average: 620 at-bats, 93 runs, 216 hits, 47 doubles, 20 triples, and 10 homers, grabbing 110 RBIs with only 30 strike outs. During his Tribe time, he nailed FOUR .310+ avg seasons. His others? .231 (rookie), .263, and .287 (his final with the Tribe). He batted 3207 times with 1003 hits, 312 walks, and only 147 strike outs. His overall Indians career average? How does .300 sound? Johnny Gray - 1 season (1957) - Gray pitched in 7 games. In his 20 total innings pitched, he managed to give up 17 runs (including 1 homer) and walk 13 players. His 3 strikeouts couldn't save him from a 5.85 ERA. He also managed to have 4 at-bats, which amounted to a .000 average. Jolbert Cabrera - 4+ seasons (1998-part of 2002) - In '98, Cabrera batted in only one game, which netted him a goose-egg average for the year. The next season, he came up to .189. His strength lies in his ability to play anywhere on the field except pitching and catching. In 2000, he brought his average up to .251 and in 2001, he helped the Tribe during the LCS by getting on base in his only at-bat. His average that year was .261. In 2002, his .111 average in 72 at-bats got him traded to the Dodgers. For Christmas, my wife got me "Fear Strikes Out," a baseball movie based on the book by the same name about Jimmy Piersall of the Red Sox. Today, since I am getting over the 'crud,' I decided to pop in the video and take it for a spin. The DVD itself has nothing special or 'bonus' about it. You get the main menu which basically consists of SETUP, PLAY, and CHAPTER SELECT. For those of you that don't know about this baseball movie, it stars a young Anthony Perkins (three years before Psycho) and Karl Mulden. Perkins plays Piersall in his early days as he battles with his grip on reality which ultimately leads to a breakdown. The movie was made in 1956/57, so there is a lot of that 50's "cheesy melodrama" in the movie, but it is actually pretty well done. Perkins definitely shows some of Norman Bates behind those eyes during the darkest (both literally and emotionally) moments of the movie. The movie holds it own, even today, in the story it tells - a father who forces his child to live out unfulfilled dreams. The fact that it is based on a real player makes the story even more poignant. He batted in only 6 games his rookie year before his breakdown, then came back two years later to play a total of 17 years in the majors. 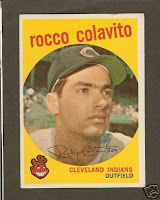 He played two years with the Tribe (1960-61), wearing Number 37, so we'll see him again later in the Uniform countdown! His overall career average? How about .272!? If you have not seen this movie, I whole-heartedly recommend it. It is unrated (seeing as it was made in 57), and there was nothing in there that I saw that would be a problem for children to see. I've had several folks write and ask me what program I use to keep track of my cards. The short answer is a program called The CardCollector 7.0 (found here). I have gone through several different methods of keeping track of my collection. I "grew up" using Microsoft Access for any database that I had to program myself. So, once I decided to move from paper to computer, I created my own very rudimentary database. The problem was that I wanted a pre-populated database. That is, I wanted something that someone else had already loaded up with cards, manufacturers, etc, so that I could just look up cards and add my quantity to the program. That is when I discovered a program called WinCards (from the now defunct www.wincards.net). WinCards was an Access-based program that came pre-loaded with a lot of cards. It was not perfect (as I have found that no one program will ever be), but it let me put in my cards and it let me add sets for cards that were not already in there. I did not care for the reports it generated, and from what I remember, I could not easily create custom reports. The other problem I had was support. The guy who wrote it did it as secondary to his main job (which I can understand), but the updates and fixes were slow in coming. The program was supposed to be updated monthly, and for a while it was. Eventually, it was bought out by another company, but soon even they couldn't keep it going. The Access-based application was showing its age - database size limitations, the Access 2.0 backend would conflict with newer versions of Access, demand for updates, delays in updates, etc. I tried Beckett's online inventory thing, but that is way too cumbersome for me. I need to be able to input cards quickly, and web-based interfaces just are not as fast/friendly as I need. So, that got scrapped pretty quickly. After that, I looked online for free card collecting software (hey, I'm cheap!). There are a lot of programs out there. None of the free ones I found come pre-loaded. For me, that was a big deal. For you, it might not be. Frankly, I didn't want to have to take the time to create sets, add cards, etc. So, free was out for me. After giving up on those programs, I really didn't do much at all as far as electronic record-keeping goes. I decided that I wanted to wait until I found a program that met my criteria: Updated regularly, allowed for custom reports, allowed for custom sets, easy to use, came with players assigned to their pictured team, allowed for import and export of information in comma separated files so that I could manipulate the data myself if needed, and whatever other features I thought were cool. I have not found that program yet, but CardCollector was close enough for me. It has all the features I want except the export/import from fully comma-separated files. Evidently, that is not a big deal to most collectors. I can live with that. CardCollector comes with a TON of cards pre-loaded, is updated monthly, lets me add my own card sets for those that have not been added already, allows me to create custom reports (though sometimes that is a bit frustrating), and allows for rapid entry of large inventory. It does let you export to a comma-separated file, but it is not very user-friendly (that is, I can't take it into Access or SQLExpress and manipulate the data very easily). Before you run out and buy the program, let me say that once I started entering my own custom sets, I haven't bought an update yet. I am going to buy the current update so that I can see if it hoses my collection (that is, if it wigs out when it finds a collection I have added that it then tries to add). I'll let you know how that goes. Also, before you try to run any reports, be sure you click the "Save Changes" button. I spent hours entering data without leaving the program and without saving (I didn't know it did not auto-save), and when I tried to run a report, I chose something that caused the program to crash and I lost all the entries I had done up to that point. UGH! I think the two main features that I use regularly are the ability to only display cards from a given set by team and the use of the keyboard shortcuts. By limiting the view to, say, Topps, baseball, 2005, Chrome, Indians, I can easily use the keyboard to add cards and move to the next player. In this example, I would hit the "+" key to add a card, then hit "PgDn" to move to the next card in line. This is great for going through a stack of Topps Chrome cards from 2006. The downside to this program (to me) is that I have not found a way to bulk-enter cards by player. So if someone sends me a stack of Sabathia cards, I have to sort them by manufacturer, then by year, then by "model" (Chrome, etc) before I can put them in the database. Not too bad for, say, 20 cards. But, not too fun for, say, 150 cards of the same player. UGH. There are a bunch on there, and there are a lot of pictures to help you identify the cards in question. I can't remember the card I was researching when I came across his site, but when I found the site, I knew I had to bookmark it ASAP! My Indians collection has been growing, especially lately with various by-mail trades and purchases I've made in relation to my All-Time Jersey Numbers. According to my database, I am sitting at just over 6600 non-duplicated singles. The program is not really a "complete inventory," so 6800-7000 is probably closer to the latest tally. One thing I have learned about collecting a particular team's cards - no matter how big the collection gets, there will always be cards you need... One of the difficulties in collecting team sets, though, is that you never REALLY know how 'complete' your collection is. In 2002, I bought a CD with only Tribe cards listed (got it on eBay, not a bad purchase, but not very helpful in a lot of ways since I do database programming), and it had roughly 15,000 cards listed. I knew that was incomplete because I had many cards that were not in that database. Unfortunately, I have yet to understand the crazy reporting system in CardCollector to get it to simply tell me how many INDIANS cards it has in its database. I must be thinking too hard on that one. In any case, I would venture to say that if I aimed for 50-75,000 individual cards, that would be a good start. So, in some respects, I am sitting at roughly 10% of the total population of Tribe cards. While researching players for the All-time Triber Uniform #5, one name jumped out: Lou Boudreau. From his nearly-perennial All-Star appearances (sometimes in nomination instead of in-game) to his World Series win to his Hall of Fame induction and Indians jersey being retired, Boudreau evokes both the memories of days gone by and of what baseball players should aspire to become. Lou Boudreau - 13 seasons (1938-1950) - I feel like I could not say a word, and if you know anything about Indians players, or HOFers at all, you know without a doubt who the all-time #5 Triber is. Nonetheless, I don't feel I would do the list justice if I did not at least touch on some of the highlights of this amazing Indians player. In 1938, Boudreau had one at-bat in one game. He was walked. Over the next 12 seasons, he would not hit anything less than .257 per year. Add to that EIGHT All-Star selections, an AL championship and the 1948 World Series title. In 1944, he won the AL batting title. In three seasons, he led the AL in doubles. 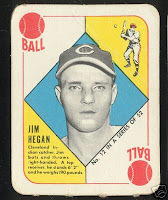 In '48, he helped the Tribe end the seasons tied with the Red Sox (while limping on an injured ankle, no less). This led to a one-game tie-breaker, where Boudreau hit 4-for-4, knocking in two homers for good measure. Defensively, he held the record for the most double plays in a season (134) for TWENTY-SIX YEARS (only three other shortstops have bested that record). In 1970, he was elected to the Hall of Fame, and the Indians retired his number that year. His baseball resume' is pages long, and not only covers his playing career, but also his managing and sportscasting work as well. Oh yeah, and he also played pro basketball. Lew Fonseca - 4+ Seasons (1927 - part of 1931) - Lew was truly an all-around player. While with the Indians, he played shortstop, 1b, 2b, and 3b. On the 1930 W554 I bought, he is listed as an outfielder (not a position he played while with the Tribe, though he did play OF for the White Sox). Later in life, he also pitched for the Sox. In his time with the Tribe, he batted .279+ each season, but this does not really cover his true averages. He batted .311 his first year, then .327, .369, .279, and .370 respectively for each year with the club. His 1929 .369 average was his career high and also earned him the AL top-hitter title that year. An interesting tidbit about Fonseca is that he is one of the first guys to use film in order to find weaknesses in other players. In 1928, he broke a leg, and in 1930, he broke an arm. Looking at his stats from those years, it is easy to speculate just how far he might have gone: 1928 - 263 at-bats (in 75 games), 38 runs, 86 hits, 19 doubles, 4 triples, 3 homers, 36 RBIs with only 17 strikeouts. 1930 - 129 at-bats (in 40 games), 20 runs, 36 hits, 9 doubles, 2 triples, 17 RBIs. 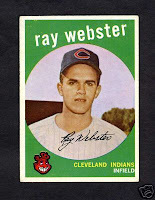 Ray Webster - 1 season (1959) - Webster played in 40 games for the Tribe. In 74 at-bats, he got 10 runs on 15 hits, including two doubles, a triple, and two home runs with seven strike outs. He left the Tribe with a .203 average before being traded to the Red Sox. Roger Maris - 1+ seasons (1957 - part of '58) - Before Maris was "ROGER MARIS! 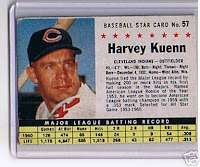 61 in '61!," he began his MLB career in a Tribe uniform. He batted in 116 games his rookie year for 358 at-bats. Would his rookie career be a taste of what was to become of this up-and-comer? You decide. He scored 61 runs (hmmm) on 84 hits with 79 strikeouts. He also got nine doubles, five triples, and fourteen home runs, bringing in 51 RBIs. In his rookie seasons, he hit an "on par for a Triber" .235 average, and his next stint (only 51 games) left him with a .225 avg. A little non-Tribe trivia: Did you know that he never batted better than .281? Did you know that his 61 homers in '61 netted him a .269 avg? Just some neat facts about Mr. Maris. Sammy Taylor - Part of 1 season (1963) - Taylor batted in 4 games for the Tribe. In his 10 at-bats, he scored one run on three hits and struck out twice. He finished his MLB career with his best average of his ball-playing years: .300 (which followed his career low of .000 in three games with the Reds prior coming to the Tribe). 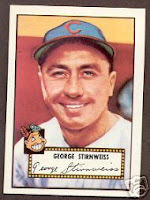 Snuffy Stirnweiss - 1+ seasons (1951 - part of '52) - George "Snuffy" Strinweiss hung around the MLB just long enough to get himself a 1952 Topps baseball card, then he was done. He came to the Indians from St. Louis, batting in 50 games his first season and in just one game in '52. He had a total of 88 at-bats, netting 10 runs on 19 hits with 1 homer and 4 RBIs. Amazingly, he was walked 22 times (that's a walk in every four at-bats). He also managed to strike out 25 times, which left him with a .216 avg his first year, and a goose-egg his final year in the majors. Steve Demeter - Part of 1 season (1960) - Demeter was born, ironically, in Homer, Pa. Ironic, you ask? His entire MLB career consists of 15 games (11 for the Tigers and 4 with the Tribe) and he had no homers in any of those games. In his 5 at-bats with the Tribe, he had one strikeout and no other hits at all. Like several of the Tribers in our lists, he left Cleveland with a zero average. 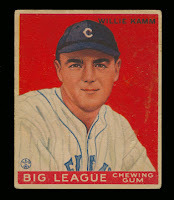 Willie Kamm - 4+ seasons (Part of 1931-1935) - Kamm charged onto the field for a .295 average his first year in an Indians uniform (his 2nd highest avg), and he followed that up with .286, .282, and .269 seasons. In his last season, he batted 18 times in 6 games for a .333 career-ending average (not a bad way to end a 13-year career). I left the laptop that has my Indians Uniform database on it at the office (DUH! ), so to keep my card collecting hobby (obsession?) going, I decided to wade through the cards I have yet to enter into my collection database. Things were going along smoothly until I ran into the two little guys you see above. My regular readers know what a sucker I am for oddball stuff. Well, I have two specimens that I need some help with. These are Dover reprints, but there are NO date marks or anything on them. 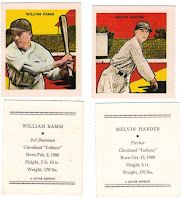 These cards are small (1-7/8" x 2=1/2") and have the familiar perforations of a Dover Reprint. These were obviously in some book of reprints, but I'm having trouble figuring out the date. Heck, I'd even take the date of the "original" cards that these were made from. 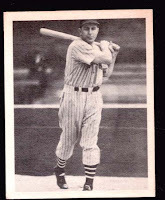 To tell on myself, which also happens to show the lengths I will go to in order to make my cards more "collector" friendly than "prospective buyer" friendly, I recently won an auction for a 1934 Goudey "Batter-Up" Boze Berger card (the one I used for his picture in the Uniform contest). The card came in a PSA hard shell (graded PR-1, for those who collect graded cards). With a little elbow grease, I managed to get that puppy busted out of there, and now it will go into a 9-pocket page like 99% of my other Indians things. I like to "experience" my cards - touch them, turn them over in my hands, etc (though I did not actually 'fold it to make it stand up - I'm not quite THAT heathenistic(sp?)-LOL). Yeah, I could have left it in its 'graded state,' but that is not why I collect. Some time ago, I posted a message about receiving a couple of padded envelopes in the mail (refresh your memory, if you'd like). One of these contained a large Joey Belle sticker and a large Luis Medina sticker. I had not seen these before, but was told they would be about 1989/1990. After poking around several resources, I finally came across the answer! According to the "Standard Catalog of Baseball Cards, 2007," these are the large 4-panel versions of jumbo stickers produced by Publications International in 1990. There were two sets made: Hottest Players and Hottest Rookies. These shown, the ones from the envelope, are from the Hottest Rookies set. There were 56 stickers in each set, and the only way I knew which set these belonged to was because these are only listed in the Rookies set (whew!). The stickers are identically laid out in each set: Player photo surrounded by white border, blue border at top, red border with name at the bottom. Players tend to "pop-out" of the white framing (see how the border goes "behind" Belle's right arm and Medina's bat barrel?). Bobby Young - 1+ seasons (part of 1955-1956) - It's not often you find a player who experiences a career high average followed by his career low. But, Bobby Young managed to give the Tribe just that. In 1955, Young came to the Indians from the Orioles to bat in 18 games in which he got 14 hits and 6 RBIs. He finished up with a .311 average. The next season, he batted in one game and ended up with a zero average. Bubba Phillips - 3 seasons (1960-1962) - In 1961, he hit two grand slams (the only ones of his career) and batted his highest Tribe-based average (.264). In his three years as an Indian, he had 151 runs on 353 hits with 32 homers in 1412 at-bats, getting 159 RBIs. Buddy Booker - 1 season (1966) - Buddy only played in 18 games. At 28 at-bats, he got 6 runs, 6 hits, and 2 homers while bringing in 5 RBIs and striking out 6 times. He left the Tribe with a .214 batting average. Cal Neeman - Part of 1 season (1963) - Neeman only played in 9 games as an Indian. In nine appearances at the plate, he was walked once and struck out 5 times. Unfortunately, he joins the list of Tribers who left Cleveland with a .000 average. 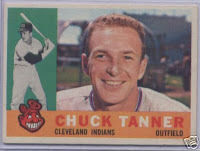 Chuck Tanner - 2 seasons (1959-1960) - Being from Pittsburgh, I am much more familiar with Tanner as a Manager/Coach during the "We Are Fam-I-Ly" days of the Pirates. As a Triber, he played in 35 games total, scored 9 RBIs on 8 runs (19 hits, 15 strikeouts) and came up with a .250 in '59 and .280 (his 2nd highest average) in 1960. Having the split personality of a person who likes both the Tribe and the Pirates, I have to say I'm glad Tanner went on to a Managerial career later in life. Hank Majeski - 4 seasons (Part of 1952 - part of 1955) - There is a bad personal watercraft pun in here somewhere, but I'll leave it to you to come up with it. In his first three seasons with the Indians, he batted for .281 or better. He had 273 at-bats in a Tribe uniform, scoring 26 runs with 44 RBIs. In '52, he pulled a .296 avg (.377 OBP and .333 SLG) without hitting a single home run. According to www.baseballlibrary.com, "he replaced Al Rosen at third base in Game Three of the 1954 World Series and delivered a pinch-hit home run in Game Four." Unfortunately, he left the Indians batting .188 before going to the Orioles. Johnny Romano - 5 seasons (1960-1964) - Romano scored 40 runs, 12 doubles, 2 triples, 5 home runs, with 52 RBIs on 86 hits during his first year with the Tribe (.272 avg). The next two years, he played for the AL all-star team (21 homers in 1961 and 25 homers in '62). During his Indians career, he maintained a .460+ SLG except for one season ('63) which he had fractured his hand. Though he won't be able to pull off the All-Time #5, we'll see how he fares in the #11 list of candidates. Kit Carson - 2 seasons (1934-'35) - Carson shares his name with the American Frontiersman, which is always cool. Our Kit Carson, though, played right field. In his two seasons, he only played in 21 games, netting him 40 at-bats. He wasn't able to pull off any home runs, but he scored 5 runs on 10 hits. He also had 4 doubles, a triple and 2 RBIs during his career. He batted .278 his first season followed by a .227 avg.